"My husband loves the taste of Ranch tortilla chips. You don't have to use Ranch flavored tortilla chips. Play with different flavors and see what you like best! This is also healthier since you bake it, and clean up is a cinch---just wad up the foil and throw it away!" Preheat oven to 450 degrees F (230 degrees C). Line a cooking sheet with aluminum foil and spray lightly with cooking spray. In a shallow dish, mix together crushed chips, chili powder, salt, and pepper. In another bowl, mix egg and oil. Dip catfish in egg and oil mixture, then dredge in chips mixture. 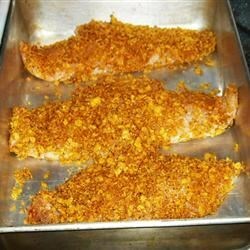 Place catfish on foil-lined baking sheet, and sprinkle any leftover chip mixture over the catfish. Bake in a preheated oven until catfish is flaky and white in the middle, 10 to 12 minutes. What's cooking in Humble, Texas? Stephan's authentic deep-fried catfish. Or use Harvest Cheddar Sun Chips! I love the taste of cool ranch doritos, but its so distinctive and almost too strong. This was great with ordinary corn chips and a very easy recipe! Thought this was great! Next time I'll rev up the chili powder a tad but the combo of ranch tortilla chips & the zip of the chili powder makes a very bland fish very good. Super Easy! I needed mine to be gluten free so I used plain corn tortilla crumbs (you can get them in the bread crumb aisle) and added ranch flavored popcorn seasoning. Excellent! This was fast and good! Who would have thought that that taste had the dorito's in it? ?